New for 2018 we are delighted to announce the addition of our Luxury Self Cetering apartments ‘The Mews @ Roundthorn’, set in our beautifully landscaped grounds. With the dramatic landscape of the Lake District on the doorstep, whether it be for a Summer walking break, a romantic getaway or to cosy up in the Winter months, The Mews @ Roundthorn is an idyllic holiday destination all year round. Furnished to an exceptionally high standard, The Mews @ Roundthorn provide you with the flexibility of being self-sufficient and able to relax in your own surroundings, whilst still being able to enjoy the impeccable service and luxury of the hotels facilities. Whether it’s just the two of you, a group of friends, or you are bringing the extended family, our apartments guarantee you plenty of luxury. Each apartment is furnished with everything you need for a short break or relaxing holiday and our team are always on hand at the hotel to make sure that your stay is so perfect that you won’t want to leave………..
Monday 5th September will again see world class cyclists taking part in the tour of Britain pass through Penrith as part of stage 2 of the tour. From Carlisle the riders will immediately head south to Penrith before turning west and tackling the hills of the Lake District, including Whinlatter Pass. The sternest of these tests is likely to come in Ambleside as the peloton take on the climb notoriously known as ‘The Struggle’. The subsequent descent will then take them down to Windermere before the run in to the finish at Kendal. We are expecting to be very busy that week, so to come and stay with us before heading into town to catch a glimpse of the action please call us on 01768 863952 – Why not make a week of it, bring your bike and explore all that Eden, with its epic scenery, has to offer? We’ll look forward to hopefully seeing you! 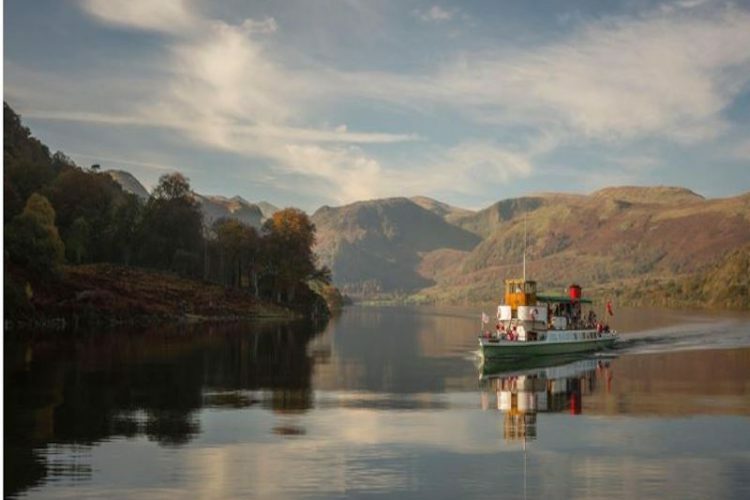 The new twenty-mile walking route around the Ullswater valley, namely ‘The Ullswater Way’ was officially opened on April 25 by Lake District writer and broadcaster, Eric Robson. The route can be walked in either direction and from any starting point. There is also the opportunity to walk the route in shorter sections, using an open top bus or an Ullswater ‘Steamer’ to start your journey. Here at the Roundthorn we have plenty of information on bus routes and Steamer timetables, and if you are staying with us you are welcome to make use of one of our special 10% discount vouchers towards a steamer journey. The creation of a promoted circular route around Ullswater has long been an ambition of the community, so the opportunity was seized and a partnership project was put into action between local people and Lake District National Park, the National Trust, the Ullswater Association, Eden District Council, Ullswater ‘Steamers’, and See More Cumbria with additional funding from the Cumbria Waste Management Environment Trust. The route has new waymarkers, fingerposts and gates to make it easier for people to navigate the route on the ground. Watch the video from the Lake District National Park to learn more about how the project was developed. A leaflet has been produced to accompany the route which can also be downloaded via the Ullswater.com website. 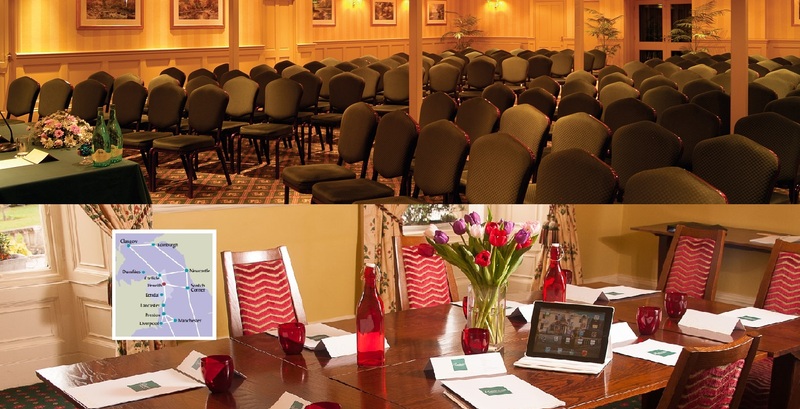 We’re well known for our excellent conference and meeting facilities here at Roundthorn Country House Hotel attracting businesses from far and wide as well as from with the county of Cumbria. 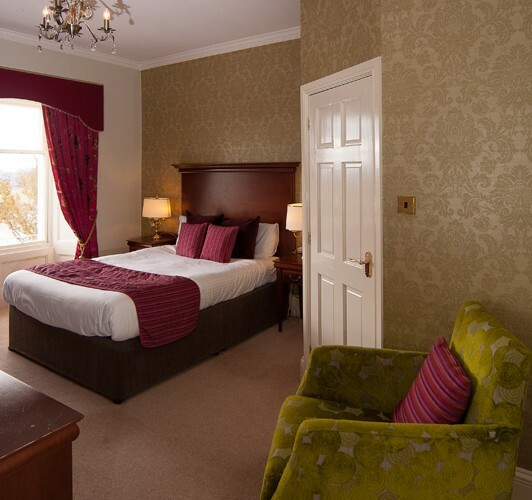 Our largest room is The Cumbrian Suite. This light, bright and airy multi functional room can accommodate up to 150 delegates when set up in Theatre style but it can also be transformed into Boardroom, Cabaret or Classroom styles allowing delegates in numbers of 20 to 100. The Cumbrian Suite is fitted with a variety of features for the needs and what businesses and organisations expect from a modern conference venue. Starting with comfort and the room is fitted with air conditioning, a choice of either natural light or full black out depending on the presentation and easily controllable lighting. Onto technology and the room features a sound systems and hearing loop and free W-Fi. As well as the hearing loop, The Cumbrian Suite has disabled access for wheelchair users or for those with limited mobility. 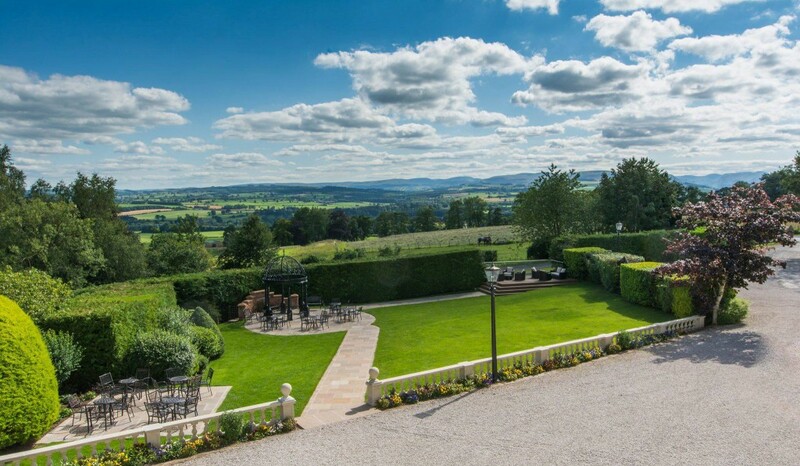 The grounds of the hotel are the ideal place to get some fresh air in between presentations with views of the Eden Valley and Lake District fells. Roundthorn is easily accessible from the M6, just 4 miles from junction 40 and is just 2 miles from Penrith Train Station where the West Coast Mainline operates from London Euston to Edinburgh. There are both Day and 24 Delegate Rates which can be viewed here, http://www.roundthorn.co.uk/wp-content/uploads/2015/03/ConferencePack2015.pdf in our comprehensive conference pack along with all the other information relating to The Cumbrian Suite and the hotels other three meeting rooms. It’s been a tough few days in Cumbria due to the flooding but CUMBRIA IS OPEN and we’ve got everything you need to make Christmas extra special. And the bad weather didn’t halt the Penrith Winter Droving festival earlier this month which marked the start of a full packed festive event line up in Penrith. There were stalls, plenty of tasty local food, street entertainment, a fabulous torch procession, music and of course, hundreds of people enjoying themselves. Wooden chalets will fill St Andrew’s churchyard with crafts, gifts and decorations for some enjoyable last minute shopping. Peruse the stalls with a warming glass of mulled wine and soak up the festive atmosphere. Visitors may even see Santa if they’re lucky! There’s Christmas Jumper Day on December 19th where everyone is encouraged to wear festive knitwear, all the shops and businesses will be doing so to raise money for the festival. Visit http://www.penrithwinterfestival.co.uk/whats-on/ for more information. After all that shopping, come to the Roundthorn Country House Hotel for a festive afternoon tea in front of the fire. At just £14.75 per person it’s the perfect way to start celebrating Christmas full of sweet and savoury delights, a choice of spiced hot chocolate or maybe something a little stronger in the form of a festive cocktail or glass of mulled wine! Visit http://www.roundthorn.co.uk/ for more details or call and book on 01768 863952. Christmas is a time for celebrating before, during and after we say. Penrith is such a lovely place to visit for Christmas shopping and for a Pre-Christmas getaway. From Christmas themed events, screenings and shows at Rheged to the big lights switch on in the town centre on Saturday 28 November, Penrith comes alive with full on festive cheer. In fact, the big lights switch on marks the start of the Penrith Winter Festival. Beginning on November 28 and running right through until December 24, this event in its fourth year aims to bring as much festivities to the town and its visitors as possible as well as encouraging them to buy local from the high quality choice of shops on and around Penrith. 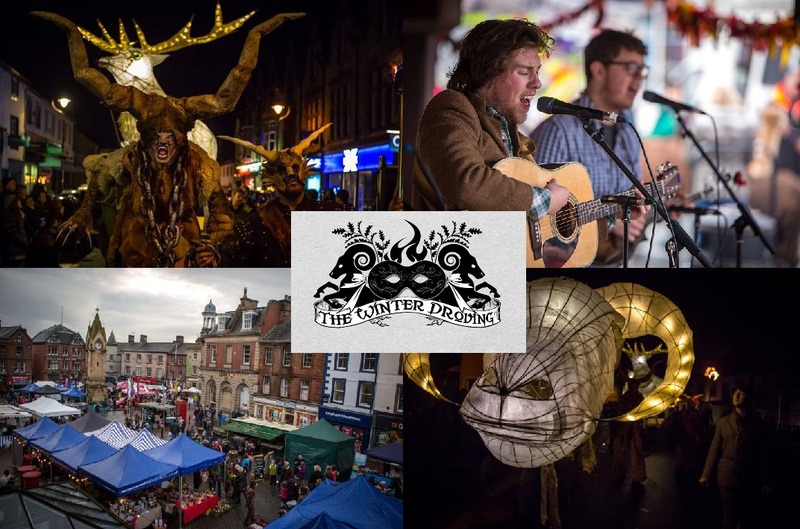 Full details of the Penrith Winter Festival can be found here, http://www.penrithwinterfestival.co.uk/. At Roundthorn Country House Hotel we hold Christmas party nights for work and social gatherings, private lunches and dinners for 10 to 200 guests as well as our new Festive afternoon tea. Any one of these can be combined with staying over in one of our 10 sumptuous bedrooms. We love Christmas time here at Roundthorn and we’re sure you will too. Take a look at our full Christmas menus, events and packages here, http://www.roundthorn.co.uk/christmas/. The Winter Droving Festival held in Penrith annually in November is always an exciting event for us, the area and for our guests. Each year it gets bigger, better with more things to see, do and watch and even bigger attendances. This year is definitely set to follow suit with even more music than before with a new event, The Masqued Mash Up After Party. This will be a large indoor gig at Penrith Leisure Centre with hugely popular bands such as The Baghdaddies, The Electric Swing Circus and Holy Moly and the Crackers. This will be taking place after the procession and when all the town centre action has finished. Being held during the day and going right through into the night creates an extra special experience for all who attend with the torch parade being one of the biggest spectacles. During the day there will be Cumbrian food and craft markets so a good chance to sample some delicious food, buy some to take home or start the Christmas shopping. Alongside the markets will be street performers and music through the day too, a fair and fun shows such the highly entertaining dog fancy dress competition (although we’re never sure how much in agreement the dogs are with this!). Visit http://www.winterdroving.uk/ for the full event details and schedules. Cumbria and the Lake District, year after year voted as the most romantic destination in magazines, newspapers and online. Whether it’s for a romantic weekend break, a place to pop the big question, a location to get married or for a honeymoon, the Lake District has been renowned at the place for romance for decades. And decades it really has been for the Lake District was a hugely significant location within the Romantic Movement with the Lakes poets of Wordsworth, Samuel Taylor Coleridge, and Robert Southey leading the way. But to more modern times and scenery, period properties, facilities and photo opportunities at every angle is why the Lake District and Cumbria is wedding heaven, the problem is just, where to choose. With wedding guests coming from far and wide, choosing a location with easy access is one of the top criteria. Penrith, just off the M6 yet with the Lakeland fells on the doorstep and the Eden Valley surrounding it means the happy couple and guests are all super happy. Photographic memories with a backdrop of the Eden Valley and Lakeland fells are right there and none more so than at the Roundthorn Country House Hotel. When it comes to food during the day then Penrith is lucky enough to be surrounded by high quality producers and suppliers including Appleby Creamery for cheese, local farms for organic chicken, lamb and beef as well as the heritage and origin of one of the most popular deserts of all time and most definitely of the moment, the famous sticky toffee pudding all of which can be chosen from the varied wedding breakfast menus available at the Roundthorn. Enjoy a bright summer wedding or a magical winter wedding in Penrith. Visit http://www.roundthorn.co.uk/weddings/ to view all of the Roundthorn wedding packages, services and images. What a week it was throughout the country for the 2015 Tour of Britain. 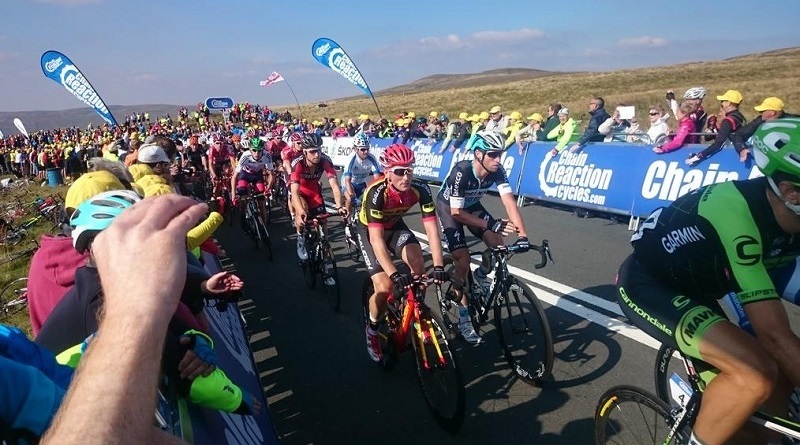 On the whole good weather but stage 5 with the highest summit finish in TOB history, was the stand out and that’s not just us being bias with it being in Cumbria! Stage 5 dropped down from Carlisle across to Ullswater and long the stunning lake before heading across to the Eden Valley with the finish and pinnacle of the Skoda King of the Mountains points, the 1903 high, Hartside Pass. Over 5000 people lined the pass with the majority at the finish line. They were rewarded with great weather, a great atmosphere and a win by a British team, Wout Poelsthe of Team Sky. Television viewers got to see in great slender the fantastic and diverse landscape of the Lake District and Cumbria that is made for cycling, visiting and walking. Many cyclists and motor bikers will know of this road but for those who didn’t, it really put this area on the map and the turnout of businesses, locals and visitors was immense, everyone really did do Cumbria proud and surely the reason why the county was chosen to host 2 stages this year. The Eden Valley and Penrith sit perfectly between the Northern Pennines and the Lake District. Cycle routes are plentiful for any ability whether it’s just for a leisurely tootle or taking on the mighty 8km climb of Hartside Pass, the equally as challenging Great Dun Fell or the slight gradients within the Lake District. The Cumbria Tourism GoLakes website has some great routes in and around the Eden Valley and North Pennines including Penrith, Ullswater and Alston which can be downloaded by clicking here, http://www.golakes.co.uk/adventure-capital/cycle-guides-download.aspx with many that can be started from Roundthorn Country House Hotel. Roundthorn makes an ideal base, there is a large private car park and the hearty supper menu is just the ticket post epic Eden cycle! Visit http://www.roundthorn.co.uk/ to book a short break and take advantage of cycling in the Eden Valley. Thursday 10th September will see world class cyclists taking part in the tour of Britain pass right by the Roundthorn Country House as part of stage 5 of the tour. We are expecting to be very busy that week so to come and catch a glimpse of the action and stay over with us please call us on 01768 863952 – Why not make a week of it, bring your bike and explore all that Eden, with its epic scenery, has to offer? Or for those who just don’t have the time to stay, what about visiting for the day and enjoying a scrumptious Afternoon Tea when the cyclists have passed by? With the tour passing us at around 2.50pm it’s the ideal time to enjoy a leisurely afternoon overlooking the Lakeland Fells. More information on the tour passing through Penrith and cycling around the local area can be found on www.visiteden.co.uk..